Wow. I feel guilty for only posting on two books last week, so get ready for some zingers during this one. And to start it off right, here's the Great Monday Give. I've mentioned the books in the 'Dandelion' series also known as the 'Read Me a Story Program'... yes? no? Well, I came across a duplicate copy of one I reviewed, and I want to pass it along to one of you guys. The hardcover, vintage flip book of Grimm's Fairy Tales and Babar the King. To be entered to win, all you have to do is comment on this post before midnight ~ September 27 ~ Sunday. I'll select a winner at random and post the results the next day. Two books for one, can't beat that with a stick. As for last week's give.... the winner of I am a Bunny is Urban Farm Wife. Send me your mailing info to webe(at)soon(dot)com and I'll send it out this week... congrats! And bye bye birdies. Wow. You're so generous! Thank you for all of the great reviews. wonderful...to find age doesn't matter in recalling the sweet stories of morality from youth! there will never be anything 'grimm' about 'babar' and the many lessons we learned from each adventure. here is to keeping that part of our youthful hearts alive! Ooh, these would be so lovely, especially as Babar is a big hit in this house at the mo (it was my youngest's first two-syllable word about a week ago!). The two most read books in my childhood...now I have a chance to add them to my son's growing (how much weight is safe on an upper floor) library. I just love reading the blog and seeing something new and something old each day. Would love this - our library doesn't have all the Babar books and this is one that they are missing...and is it possible to have too many fairy tale books? I would hope to add Babar to my collection. My 2 yr old loves elephants. We actually have that book checked out from our library right now. I love Babar books! I remember them fondly... I hope my kids enjoy them as much. Talk about a blast from the past! I loved Babar! Ah I'd love to win this! What a wonderful giveaway! My daughter loved the Babar books when she was little. Now she could read to her son, my grandson, and share the memories with him. I would also love to read Grimm's Fairy Tales. We could just have a three generation reading party. What great books! I love fairy tales so much. Thanks for all the great reviews and giveaways! 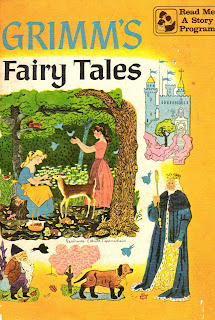 Our two and a half year old (Lily) is really into fairy tales so we keep bringing home different compilations from the library and it's so interesting to see the variations. Would love to see how this one compares, and Babar is a great bonus! These look wonderful! I remember loving Babar as a kid! lovely books! Thanks as always for the reviews! Thanks for sharing all these great books. It brings back childhood memories to me. Oh my! These were a part of my childhood! What a treasure to have and share with my grandchildren now. Hi! Thanks for the chance. I just found your site this week and spent about 2.5 hours one night (and staying up way too late) soaking up as much as I could. We hit our goodwill today and found some of your recommendations. Thank you for this blog! 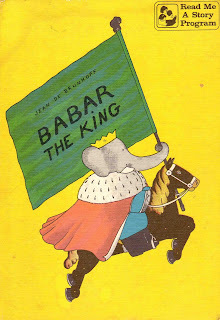 I remember the Babar of my childhood. This is such a fun giveaway. Please count me in. What a pleasure to stumble upon your site. I would luv to Win this vintage book for my Girls! I love Babar! My son would be thrilled to have this! Thanks for the great giveaway! My daughter woud love The Babar, but I would love the Grimms. Thanks for this lovely giveaway. My sisters and I read Grimm's Fairy Tales so many times when we were little that it finally fell apart. It's amazing to still be able to find these books almost fifty years later. You stir so many good memories. Thank you. Oh!! I would love to win this!!! please pick me!! !